Learn about these St. Patrick’s Day traditions as you get ready to celebrate. It’s time to dress in green and look for the pot of gold at the end of the rainbow. It’s time to celebrate the patron saint of Ireland. It’s time for St. Patrick’s Day. From wearing green to stories about leprechauns, there are many traditions that we partake in to celebrate St. Patrick’s Day. But, ever wonder where these traditions came from? 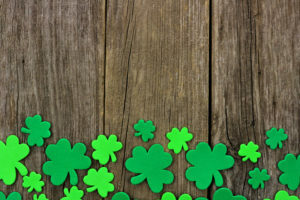 Check out these facts about St. Patrick’s Day and revel in Irish- American traditions. Everyone knows that you’re supposed to wear green on St. Patrick’s Day. While we’ve long associated the holiday with green, the original color associated with St. Patrick was blue. However, green replaced blue around the time the Irish fought for independence from England. The shamrock is a classic symbol of St. Patrick’s Day. The plant stems from an ancient Celtic tradition that revered the plant as a symbol of the coming spring. Later in Irish history, it became a symbol of Irish nationalism. These little guys are a part of Irish folktales. Their name comes from the Celtic “lobaircin” meaning “small-bodied fellow.” Leprechauns are known as mischievous fellows that play tricks on people to help protect their treasure. When it comes to eating Irish fare on St. Patrick’s Day, many of us think of corned beef and cabbage. It’s a staple in our St. Patrick’s Day traditions. While this dish is eaten in Ireland, it is said to have gained popularity on the Lower East Side of Manhattan. Irish immigrants swapped out their traditional holiday ham for cheaper corned beef from their Jewish neighbors. Don’t count on the luck of the Irish. When it comes to ensuring that you’re well protected, invest in the right personal insurance policies. Contact the professionals at Robert J. Los Insurance Agency to find you the right insurance plan. Located in Hamburg, New York, we serve all your personal and commercial insurance needs.